This recipe from a magazine clipping sat on my parents’ refrigerator for years before I moved off to college and took it with me. Someone had unceremoniously written “Gross!” while someone else countered the scribble with an equally messy “Yummy!” but it remained uncooked. I love mushrooms and asparagus, and I was enamored with the idea of cooking it, but eventually it became nothing more than a glorified refrigerator decoration. But hark! I rescued it from the depths and decided to try it once and for all. And oh, friends. It delivered. I don’t even know what magazine it came from anymore (if anyone knows, please let me know, and I’d be happy to attribute it! 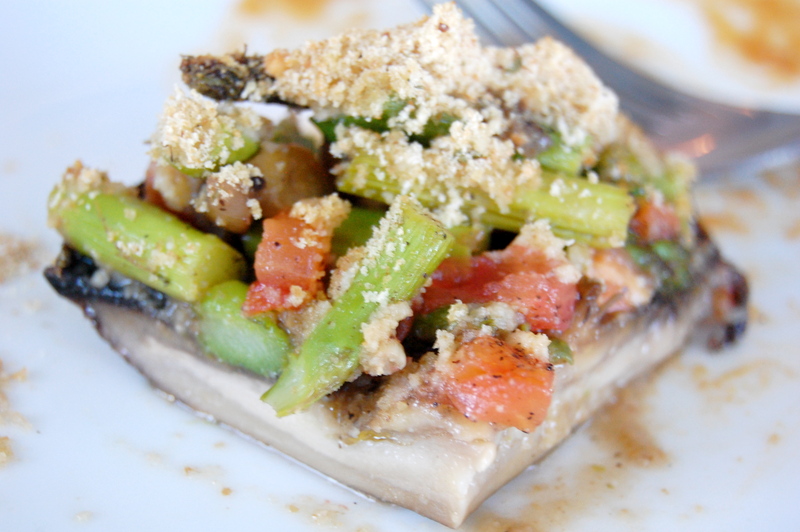 ), but if you like mushrooms and asparagus, you won’t be disappointed. I wish I could take credit for something in it, but I actually followed the recipe this time. Almost. I know. Ok, I guess the one thing I changed is that I didn’t have multigrain breadcrumbs, I only had Italian-seasoning breadcrumbs. I would use multigrain next time. It’s actually pretty quick. I am a fan of The Quick. Preheat the oven to 400°. 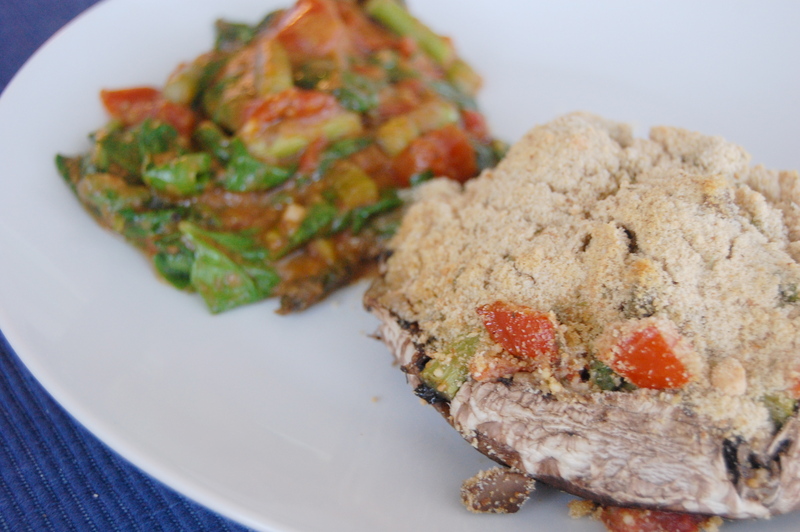 Remove the mushroom steps and coarsely chop them. Brush the 2 tsp oil over the smooth top of the mushroom caps, and place them top-down on a baking sheet (make sure you use one with edges so nothing drips into your oven). Heat the other 1 Tbs oil in a skillet over medium-high heat. Cook asparagus, shallots, garlic and mushroom stems for 5 minutes or until the vegetables are barely tender. Remove from heat and stir in the tomato, salt and pepper. Spoon the mixture into the mushroom caps. 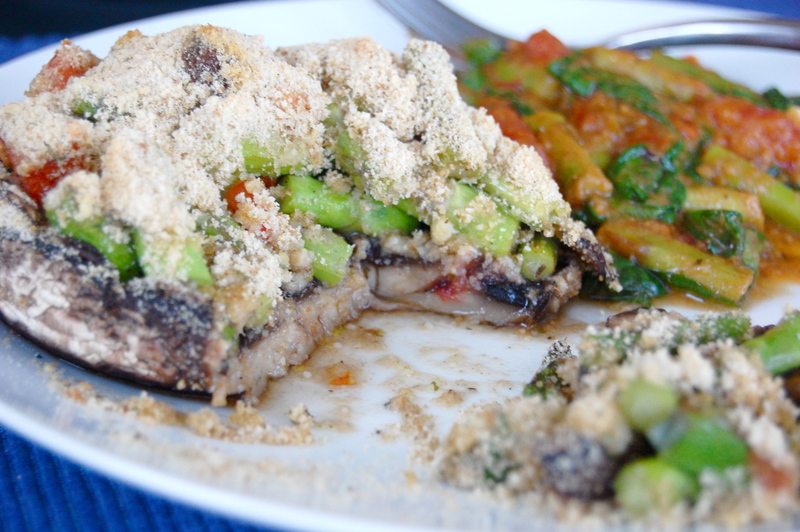 Combine the breadcrumbs and parmesan cheese and sprinkle it over the mushrooms. Bake for 10 minutes or until the breadcrumb topping is golden brown (mine doesn’t look golden brown in the picture because there was too much breadcrumb topping). A bunch of asparagus contains more than just 1 1/2 cups, so I used the leftover asparagus for the side dish. I had made a tomato dish the previous night, so I dumped it into another skillet and stirred in the remaining asparagus pieces plus a few handfuls of fresh spinach. It’s so colorful and pretty! That looks amazing! I’m adding it to my pinterest page. Oh my word, that looks good! Wow! Someone in our family finally made that mushroom recipe!! 🙂 I am so glad. The clipping was sent to me from your Aunt Kay with the highest of recommendations, but the day after I stuck it on the refrigerator, someone wrote that “gross,” and I realized not to many of our family liked mushrooms (1/2, to be exact). I just wished you made it when I was there. in the exact same area of interest as yours and my visitors would genuinely benefit from some of the information you provide here.